Whether you need a new gutter system or leaf protection, we can help. Larson Home Services installs LeafGuard brand seamless gutters. LeafGuard is not an add-on cover or screen; it's a patented, one-piece, covered gutter system. The unique, seamless design keeps debris from collecting in your gutters which prevents clogs, leaks and water damage; keeps water flowing freely and eliminates gutter cleaning. As the certified LeafGuard dealer in Greater Madison, we're proud to install the industry's only patented one-piece covered gutter system. If you're ready to say goodbye to cleaning gutters, contact us today to request your no-obligation consultation and free estimate. Will the gutter guard filter out all kinds of materials? Generally, gutter guards will keep all but the smallest debris out of your gutter. Some screen or mesh-type gutter covers won't prevent small particles like plant seeds and granules from your roof shingles from accumulating in your gutters. An effective gutter guard keeps unwanted leaves and debris out, while letting water in to flow throughout the gutter. Will roof shingles be damaged when the gutter guard is installed? Many gutter covers require roof shingles to be pried up in order to install the gutter screen or cover. The LeafGuard one-piece gutter system attaches to your fascia board, not under your shingles, so there's no worry of voiding your roof warranty. Can leaves accumulate on top of the gutter cover and block water drainage into the gutter? This can be a problem with many screen-type gutter covers. LeafGuard's unique one-piece hood design utilizes the principle of molecular attraction which causes rainwater to cling to the gutter hood and fall into the gutter trough. The narrow opening between the hood and bottom keeps debris out. Can the gutter cover come loose or be damaged easily? The LeafGuard gutter system uses .032 gauge aluminum, which is approximately 20% thicker than conventional gutters. It is also attached to the fascia board approximately every 2 feet with internal hanging brackets, unlike conventional gutters that are attached with spikes that can come loose. Will the leaf filter look good on my gutters? LeafGuard's attractive design enhances the look of your home, and comes in a wide variety of colors that compliment your home. 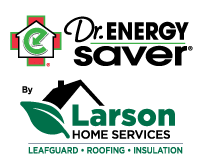 Larson Home Services is your trusted gutter company for quality seamless gutters and professional gutter installation in Wisconsin. We provide free estimates on all our gutter services in Waunakee, Stoughton, Verona, Mc Farland, DeForest, Mount Horeb and surrounding areas.